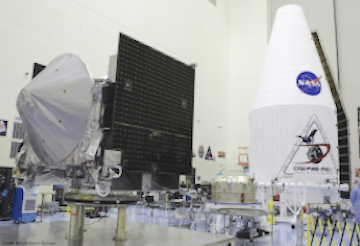 Sierra Nevada Corporation's contribution to NASA’s OSRIS-REx spacecraft preparing for launch. Sierra Nevada Corporation (SNC) is proud to be supporting NASA’s OSIRIS-REx spacecraft in its objective to analyze and return the first-ever asteroid sample for the United States. The Origins, Spectral Interpretation, Resource Identification, Security-Regolith Explorer (OSIRIS-REx) spacecraft was built by Lockheed Martin and was launched successfully from Cape Canaveral today. The OSIRIS-REx spacecraft will travel to the asteroid Bennu to analyze and gather a sample, and then return to Earth via a detachable capsule. The spacecraft includes Solar Array Drive Assemblies (SADAs) built by SNC, which support the OSIRIS-REx mission to investigate formation of the solar system and the origin of organics that may have led to life on Earth and potentially elsewhere. “SNC has now supported all three NASA New Frontiers program missions—providing thermal control systems for New Horizons and Juno, and now mechanical systems on OSIRIS-REx,” said John Roth, vice president of business development for SNC’s Space Systems business area. “We’re honored to work with organizations like Lockheed Martin and NASA, continuing our long heritage of support to solar system exploration.” SNC has provided mechanisms for over 70 NASA missions in the last 25 years, ranging from near-Earth to deep space missions. SNC’s SADAs will keep the two large solar arrays directed at the sun over its seven-year-mission, allowing them to generate power for the five scientific exploration instruments and sample collection devise on board the spacecraft. SNC’s SADAs have a strong yet compact design, using a volume and mass efficient configuration that affords the spacecraft architecture more focus on scientific instruments.